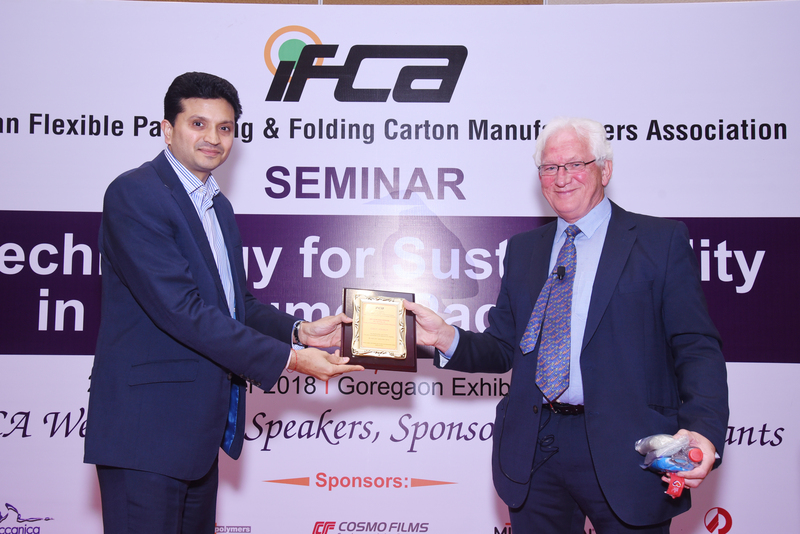 The Indian Flexible Packaging & Folding Carton Manufacturers Association (IFCA) organized a seminar discussing technology for sustainability in consumer packaging at the Bombay Exhibition Centre, Mumbai on 28 September 2018. The seminar was hosted alongside PackEx 2018 exhibition. Brilliant Polymers was a platinum sponsor of the IFCA seminar. The sessions started with keynote speaker Suresh Gupta, chairman Huhtamaki – PPL giving some insights of the packaging industry followed by Ramaiah Muthusubramanian, director of Unilever, speaking about sustainable flexible packaging at Unilever. Muthusubramanian shared that Unilever will move from linear to circular economy. “The strategy is to educate the consumer, enable EPR models and collection infrastructure, and also enable recycling and recovery infrastructure,” he said. Brilliant Polymers sponsored a talk on Sustainable Packaging and Plastic Recycling by Edward Kosior, MD – Nextek. Kosior stressed on the need to end the dig-use-discard era and recover the materials the manufacturers make so, that it can be recycled. Kosior holds several patents for the recycling plastics and been instrumental in the introduction of recycled plastics into food packaging in Europe and Australia (PET, HDPE and PP). He is also working on mitigating plastics in oceans and encouraging adoption of science and best practices in avoiding the environmental problems facing developing countries. The IFCA seminar was a great opportunity to network with big flexible packaging converters, raw material suppliers, inks and adhesive manufacturers, and film suppliers in addition to speaking with customers regarding the latest market trends and developments.